Unhygienic drinking water. Moon-cratered roads. Uncollected, stinking garbage pile-ups. Power thefts. Statue-like BBMP officers. Land grabs. Unauthorised structures. Residential plots converted to commercial properties. Bribe-hankering government staff. This list can go on and on. 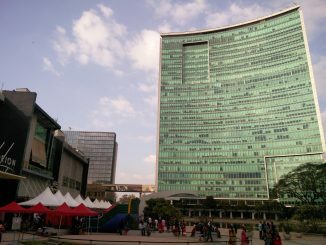 Bangalore is down in the dumps and its leaders and administrators seem to have abandoned their virtues and lost their will along with their sense of right. Looking at the current state of affairs, there appears to be no hope in sight unless the average citizen picks up the gauntlet. If the power of the Right to Information law is anything to go by, it is time for the common citizen to wake up and smell the kaapi. It may even be that the average Joe Bangalorean can redeem himself of the mess our leaders have created, and perhaps even turn into an everyday superman. This article will show you how. Figure out what your ward number is. This information is there in the BMP website, and sometimes it’s written on the yellow colour streetname signs. Your residents’ association or apartment owners’ association head will usually know this. You can also find out by calling the Corporation office. Find out who the Executive Engineer is for your ward. Get his or her name, telephone and mobile number. Now find out who the Assistant Executive Engineer (AEE) is for your area. Remember this: Mostly, the AEE doubles up as a PIO (Public Information Officer) under the RTI Act, and he is liable to give you information. In some cases the EE (Executive Engineer and in some cases the JD (Joint Director) is designated as the PIO, and there is an appellate authority who supersedes him. Now it’s time to get into action mode – fill out an RTI form and submit it to the AEE (or PIO) and ask for a list of all the development works that have been executed in your area during a certain period. For example, ask for a list of works executed for the last 6 months, or for the last financial year. Also, ask for a list of the contractors and the corporation officials who were involved with the work, the total amount spent, the budgeted amount and what is the balance left, if any. The PIO has to furnish this information within 30 days. Be ready for a delay as sometimes PIOs are not cooperative, and if their non-cooperation continues, you may approach the appellant authority that presides over the PIO and sits in the same department as him. If the appellate authority too does not act, you can approach the CIC (Chief Information Commissioner), who sits at MS Building, Gate No. 2, 3rd Floor, Dr. Ambedkar Veedhi, Bangalore-560001. The Chief Information Officer (CIC) will then take up the mater with the PIO. You must ask for a penalty of Rs. 250/- per day for every day starting from the 31st day of your original request. Once you receive the information from the BBMP, you must check to see if the work has been done as per the estimate. Check the list of development works against the actual work done. It’s as easy as that. In many cases it will not be, and that is why Bangalore is where it’s at today. This then becomes the basis to seek remedies. Note, in some cases, you should also examine tender documents to remove any doubt you may have. From the documentation you have gathered, when you are convinced that something’s amiss, you can formally complain to the Commissioner of the Corporation or to the chief of the government department as the case may be, enclosing the evidence you have assembled using the RTI Act. Tell the official, in writing, to take action and rectify the damage done and take a time-commitment from him. Wait for him to rectify the shoddy work and to penalise the guilty officers. If the top officials do not act, there are two steps you can take – approach the media. Along with unleashing the media, let us also add that it makes sense to tackle corruption in a group. You can form a group of like-minded citizens, and sure enough you will find many who are fed up with the civic infrastructure and amenities. With the evidence collected, you can complain to the top officials as a group. Another option is to team up with city-based organisations that are active in the RTI arena – their list is provided in a box on this page. Whichever way, your goal is to ask the administration, using your evidence to take action. As a final resort, you can also file a court case. Yes, this can mean even more precious time spent, in addition to all the time you may have spent in unearthing the evidence. Sometimes, this method works if the issue itself is broad and is impacting thousands of residents. Remember if a few residents welfare associations had not filed a litigation against the Sakrama law’s penalty clauses (which were holding citizens culpable and letting officials go scot free), the High Court may not have suspended the implementation of the penalties at all. Citizen action does help. The RTI Act can really work wonders because government officials are aware that if their record of indulging in corruption is made public, then the past can prove to be their nemesis and come back to haunt them even after they retire. Consequently, in some cases, it has been observed that a mere filing of an RTI application has sets things right. Roads: There’s a science behind how potholes have to be filled, but in reality they are just stuffed with tar and patchily covered up. Similarly, there is a method behind building speed humps, which is not followed. The same goes for asphalting broken-down roads. Ask for documents relating to road repairs and you are sure to find inflated estimates, high-quality materials requisitioned but low quality materials used, thickness of asphalting will not tally with that in the contract, unscientific methods used, etc. You will be able to unearth collusion between contractors and the BBMP officials, when it exists. Parks: You will see substandard kiddies’ play equipment purchased at astronomical rates, uneven pathways, gazebos and artificial plants constructed at monstrous costs, and of course, you may come across small structures that will most likely be used for a purpose other than the one they were constructed for. You can ferret out all this information and act accordingly. Garbage: Garbage cleaning is yet another scam. Most contractors do not pay the minimum wages to the cleaning staff and neither do they contribute to their PF or ESI. The minimum wages claimed by contractors from the corporation are 2,075/- per month per staff and they have to contribute to PF and ESI from the first month of employment. In reality, the wages paid range between 1,500 and 1,800, and PF/ESI contributions are not made. Check this with any garbage collector in your area. Additionally, contractors must provide safety equipment (boots, gloves, masks, full uniform, etc.) for the staff – but in many cases, what is actually provided just a coat and an ID card without a number. 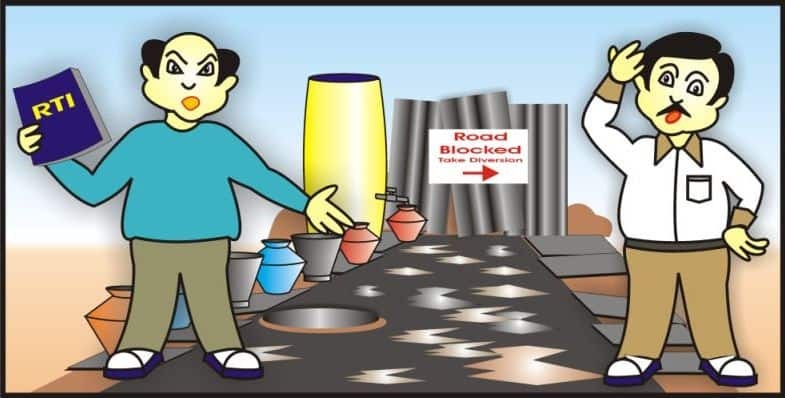 Land Scams: Government land in area can be allotted for cultural activities, parks, educational institutes, and for sites to be distributed to specified people. In every area, there will be a few stray cases involving misuse of government land. Either the purpose for which the land is allotted will not be served or fictitious claimants will usurp sites. You will also come across residential property okayed for commercial purposes without any valid reasons and documentation. These are some areas where you are sure to sniff out corruption and defects with ease. Silt and debris were being dumped in an open site. Confronting the dumper only led to altercation. 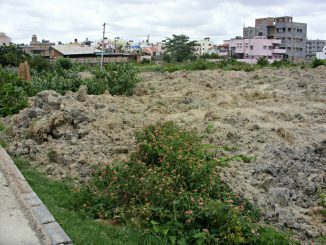 Orion Mall case: Will Siddaramaiah finally go after high profile Bengaluru encroachers? The BBMP’s inaction against Orion Mall and two other high profile encroachers has attracted a contempt notice from the High Court. Will the state finally have to take a call on the issue? By 2016, you can travel from Domlur to Hosur Road in 30 minutes! How? An elevated road of 2.4 km will come up from Ejipura Junction to Koramangala Water tank. The Nagavarapalya main road with in the C.V Raman Nagar area always has a traffic jam. Early mornings when I step out of the house to work, as a pedestrain I dont find place to walk neither on the foot path nor on the road. Their are these laborers with all their trucks parked on one side of the road to pick up people to various places. The other side of the road is blocked by the BWSSB lorries who come to clear the garbage dumped on the roads. The road is extremely small with all the school buses, cars, and every vehicle using this particular road. Every morning the road is in a chaos with the pedestrains bearing all the brunt. First suggestion: Could you please ask the BWSSB lorries to come during nights (around 11 in the night or early morning before 6) for the garbage clearance. This will bring down the traffic atleast by 10% on the road. Second suggestion: Is their something that can be done about the trucks and tempos parked by laborers on the roads. This is my voice to the Government of India and also to all other Government bodies involved in creating damages to the public and private properties. I have been paying tax as a loyal citizen of our Country, but where is all the money going? Despite of paying these taxes like sales tax, service tax, revenue tax, income tax, professional tax and what not taxes, still we lack with the infrastructure in our neighborhoods. Morning when I wake up I see lots of unclean waste lying in from of my house, despite the Municipal workers come there but they dont clean the roads properly. I have told them several times. The neighbor hood streets are damaged by one or the other Government Department. Lately the bad roads were refined in my area, two days back the road were again damaged for laying of cable line. I cant even take my bike inside the gate to park it nor take it out to go to work. If this is the case and if the Government is so in productive with soo many flaws. Then find ways to make money for yourself than imposing tax without giving proper benefits. Go take a hike, because you are not any great you’re just like an other British rule.